There is nothing quite like the combination of peanut butter and jelly. Simple, timeless, and always a classic. Growing up, PB&J was a staple for us kids. Many PB&J sandwiches were packed in school lunches over the years! I think I lived off of PB&J as a young adult going through nursing school. I often skipped the bread all together and just made a mixture of PB&J to eat with a spoon.. Anyone else do that? I've had the idea for this muffin on my mind for a few weeks now. A quick search found nothing like I was envisioning, so I browsed Allrecipes to find a suitable peanut butter muffin recipe to start with. 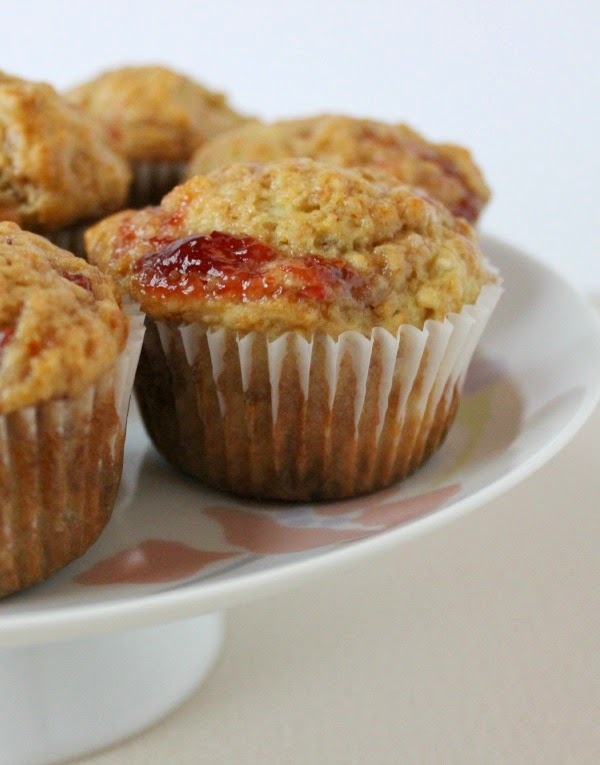 With a few quick changes, I had a great moist muffin with the classic taste of PB&J built right in! These muffins might be lower on fat and calories, but they do not skimp on taste. I bumped up the PB factor with the help of some PB2, but you could omit that extra peanutty goodness and still have a great muffin. 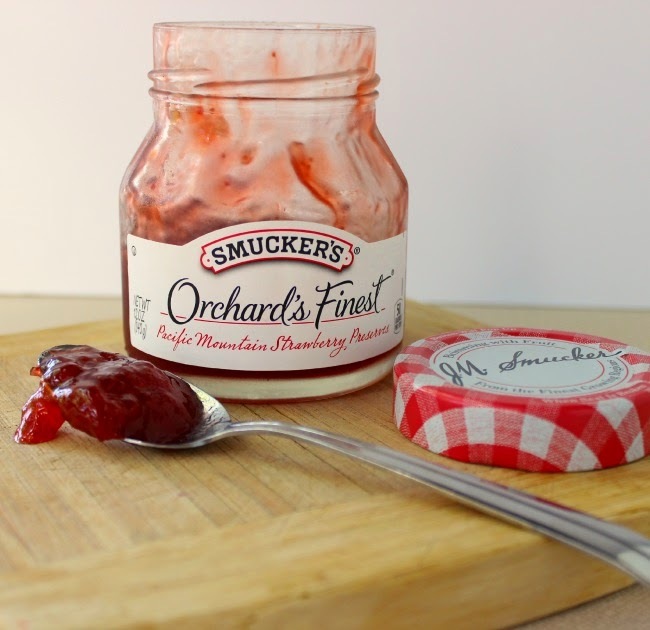 For the "J" factor, choose your favorite flavor of jam or preserves. 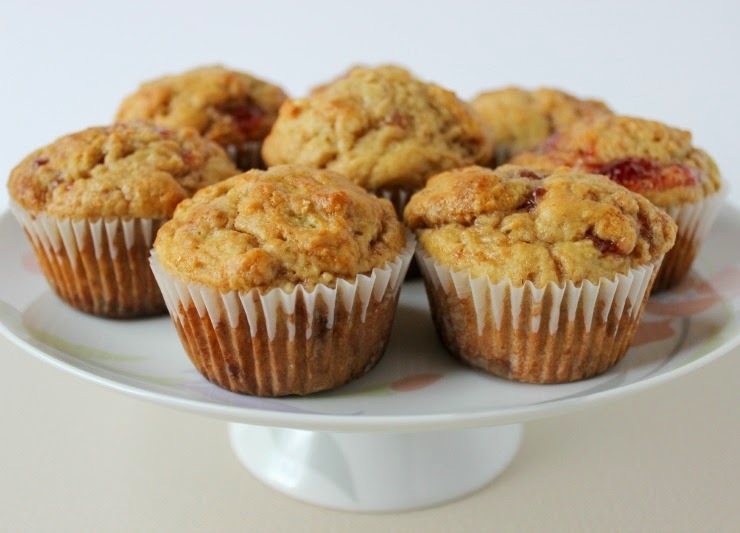 Peanut Butter and Jelly Muffins make a great breakfast treat or an afternoon snack. I think they are even good enough to be considered dessert! Bake up a batch today and bring back some childhood memories! In a large bowl, combine the flour, sugar, baking soda, baking powder, PB2 (if using) and salt. Make a well in the center. In a large glass measure or medium sized bowl, whisk together buttermilk, peanut butter, eggs, and vanilla extract until well combined. Pour the wet mixture into the center of the dry and mix until JUST COMBINED. Top the batter with the jam/preserves and fold into batter until just swirled. Fill muffin tins about 3/4 of the way full. Bake for 15 - 17 minutes. Allow to cool on wire rack. Cook time: 00 hrs. 17 mins. Oh gosh, and my life just got crazy again! Oldest child graduated from college this past weekend in a lovely ceremony. I still CANNOT believe that I am a mother to a college graduate! It seems like just yesterday, I brought her home from the hospital. For all you mom's of small children, enjoy all the years, because they really do go by so fast! The weather finally is cooperating a little better these days. Trees are finally greening up and I potted all my herbs. I am always so happy when I have fresh herbs at my doorstep to use whenever I need them. Hope all is well with everyone out there! Remember, if you haven't entered the giveaway for Healthy Solutions Spice Blends, you have until the end of this week. They are a really terrific product that I am enjoying using in all sorts of ways! I love anything peanut butter and jelly, and love that these are healthier, too. Congrats on your college grad! Given how fast the past two years have gone by with my daughter i can totally see how I could blink and be at her graduation. Thanks Nicole! Yes, they do grow up way to fast! Thanks for your hugs today Renee! And while I was never a peanut butter and jelly fan, but I think in muffin form it would be delish! My brother used to make a grilled peanut butter and sandwich and it was so oozzy, I had to look down while he ate it! Oooh, grilled pb sandwich sounds so good! Oh yes!! I am a peanut butter LOVER! I had a slice of toast this morning with what! peanut butter. thanks for stopping by Catherine! I hope you enjoy these muffins! These muffins like look amazing! Trying this recipe real soon. Thanks for sharing! Thank you! I hope you enjoy these! The muffins look absolutely stunning! :) I have a confession to make, I've never tried peanut butter and jelly together in the same sandwich ... or in the same muffin :D but these are the on the list to try! OMG...how on earth have you never tried it? haha I hope it exceeds your expectations! haha Thanks for stopping by Anyonita!